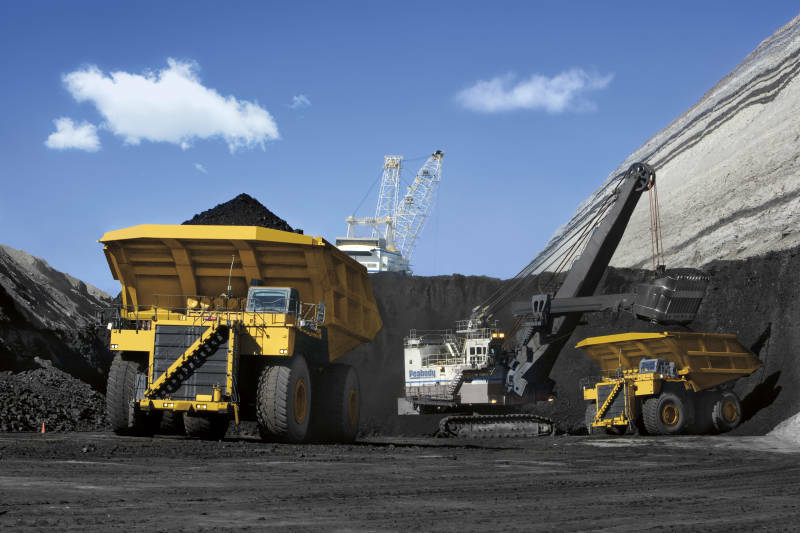 A coal-mining giant has filed for Chapter 11 bankruptcy protection amid an industrywide slump. Peabody Energy — which is the biggest coal miner in the U.S. and says it is the largest private-sector coal company in the world — is looking to restructure its heavy debt load and gain relief from its creditors. It hopes to continue operations unimpeded. The St. Louis-based company said in a statement that the pressure on the coal industry is "unprecedented." It cited a drop in prices, weaker demand from China, the rise of competition from fracking and "ongoing regulatory challenges" as reasons for the restructuring. Earlier this year, Arch Coal — the second-largest coal miner in the U.S. — filed for bankruptcy. Bloomberg noted that three other major coal miners went bankrupt the year before that, and many industry watchers had expected Peabody to follow suit. Dashed dreams of China-powered prosperity contributed to the coal giant's financial woes. Peabody bought Australian mining firm MacArthur in 2011 for nearly $5 billion. It was a bet on Asian growth, planned at a time when coal prices had been on the rise for two years. That same year, coal prices began to drop. The industry entered a long slump — where it remains today. And instead of surging, growth in China was stagnant. Today, Peabody carries a heavy debt burden. Australia's ABC News reports that Peabody owes $10.1 billion and has $10.9 billion in assets — and that the company lost $2 billion in 2015. In the statement announcing the Chapter 11 restructuring, Peabody also revealed that a planned sale of its New Mexico and Colorado mines has fallen through. Mine operations are continuing as usual, Peabody said in the statement. Last month, Inside Energy's Leigh Paterson reported for NPR on what bankruptcy means in the coal industry. She noted that a bankrupt Peabody subsidiary recently raised ire by trying to cut insurance for retired employees. And cleanup liabilities are often among the debts that a bankrupt coal-mining company is attempting to negotiate, Paterson says. Peabody said in its statement that the company is proud of its work in land restoration, or repairing areas damaged by mining, and will "meet its reclamation obligations." Shale gas, increasingly produced in the U.S. through the practice of hydraulic fracturing, or fracking, was named by Peabody as a factor in its bankruptcy. "The renewable energy building boom also is stressing the industry. Once solar and wind projects are built, the power is cheap to produce.
" 'Gas puts the immediate threat to coal, but the combination of gas and renewables places a longer-term threat to coal,' says Andy Roberts, analyst in international thermal coal markets for the consulting firm Wood Mackenzie. "He says last year was tough for coal companies, and the future likely will be even more painful.
" 'Probably, over the long, long time, only the strongest of them are going to survive,' Roberts says." One way companies can strengthen their position in the struggling industry? Declaring bankruptcy, Jeff wrote.